Producers include: Mike Dormer, Alex Graham, Gina Cronk. Series 1 and 2 are only available on DVD in the UK. No information is available on when or if the series will ever be released in NTSC (US and Canada) format. Series two episodes are currently showing on PBS stations (listed as "New Tricks" not under the PBS Mystery! series). Series 4 is showing on The Knowledge channel in Canada. Check local listings for day, time, and channel. 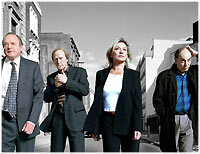 I have been an avid fan of New Tricks since I first watched the 90-minute pilot, six years ago. Detective Superintendent Sandra Pullman (Amanda Redman) was on the "fast track" for promotion until she screwed up an important assignment. She was then side-lined by being assigned to head up the new UCOS department (Unsolved Crimes and Open Cases Squad). Her staff consists of three retired detectives, each with their own foibles. The intent is to re-examine old unsolved cases to see if modern advancements in police technologies (ie: DNA screening) can "solve" or "close" the cases. Unfortunately, series #5 is disappointing in several aspects. The cases aren't very interesting. They barely mesh with the trials and tribulations of the cast. The guest stars are down right silly at times. I mean, what were the writers thinking with the young pup (DAC Strickland's nephew, of all things!) sniffing around Sandra as if she were a dog in heat or to be more charitable, the young stud out to bag the older woman and give his career a boost up. Give me a break! If it was supposed to be funny, it wasn't. It was pathetic! The storylines lacked the humor and comraderie of the previous four seasons. There was a disturbing somber tone to each of the episodes in this outing. The performances by the returning cast were lackluster, as if everyone involved had suddenly grown weary of the show. And did the writers never watch Midsomer Murders?!? One of the cases to be resolved featured Jonathan Firth as Julian Felspar (Series 5, episode 5). In the episode, his sister had a terrible secret she had been hiding through the years. Hmmm. The same actor played a nearly identical character with a quite similar problem in "Killings at Badger's Drift" in the first series of Midsomer Murders, another long running British detective series. Ex-Detective Inspector Brian Lane (Alun Armstrong) is a recovering alcoholic. He's being tempted by drink at every turn in every episode in this set of episodes. Boring. Esther, his wife, is barely seen even though Brian is spiraling out of control. No one on the squad seems to notice or care. In the overall scheme of things, I'm content to watch the first three series over and over again. Series number four is weak but still viewable. Series 5 is very weak and uninteresting so I'll be skipping it. I do hope the writers get back on track in the next series (if there is a next series) but if they can't, then it may be time to close the UCOS unit and let New Tricks end its long and generally entertaining run. "Spare Parts" -- reinvestigation of a business man’s death leads to an organ donor racket. "Final Curtain" -- the cold case involves an actor shot dead on stage by his actress wife. "A Face for Radio" -- the death of a DJ who died in an arson fire while live on the air is reinvestigated. "Loyalties and Royalties" -- the death of a 70’s legendary rock band’s lead guitarist is re-examined. "Couldn’t Organize One" -- some disturbing truths about Pullman’s father come to light. Meanwhile the team re-investigates the death of the Chief Brewer at Felspar's Brewery. "Magic Majestic" -- a magic trick that ended with murder is re-investigated with reluctance on the part of the team (all except for Brian who thinks it's an important case). "Communal Living" -- the death of a student soon after he left a commune is the unsolved case. "Mad Dogs" -- the team are up against the Ministry of Defence when they try to resolve the suspicious death of a soldier.